Tallahassee, FL—It’s been one year ago today (October 18, 2013), when it was announced that DeShon Thomas was convicted on Two Counts of 1st Degree Murder and Solicitation to Commit 1st Degree Murder. As it was posted on maul10.com, DeShon’s mother did a “praise dance” upon hearing the announcement—and rightfully so. In the name of the Father, the Son and the Holy Spirit! Jesus was falsely prosecuted—He died so that we can have life! DeShon still has his life! Daniel 10:14 Now I have come to make you understand what will happen to your people in the latter days, for the vision refers to many days yet to come. Daniel 12:2 And many of those who sleep in the dust of the earth shall awake. Some to everlasting life, Some to shame and everlasting contempt. DeShon’s arrest did not push DeShon and his family into the bosom of Jesus Christ. DeShon and his family have always been in the bosom of Jesus Christ. If this were not so—officials in Tallahassee would be going about their business as usual—instead of being concerned about what DeShon’s mother is “going to do next”. On January 28, 2011, the day after the victims were found murdered, DeShon and his mother voluntarily went down to the Leon County Sheriff’s Office to give a statement. Don Odham, a White man who presented himself as a Leon County Sheriff’s Detective, violated many of DeShon’s Civil Rights—including denying DeShon the right to an attorney. Detective Odham and DeShon’s mother had a heated exchange of words. DeShon’s mother informed Detective Odham that he was making a huge mistake with his handling of DeShon—as a minor and as a child of God! Instead of taking heed to DeShon’s mother, Detective Odham kicked DeShon’s mother out of the Leon County Sheriff’s Office—refusing to allow DeShon to leave with her. Detective Odham played a huge role in DeShon being charged with the murders. Approximately seven months of DeShon’s being charged with the murders, Detective Don Odham, himself, was no longer associated with the Leon County Sheriff’s Office. Furthermore, Detective Odham was NEVER a Leon County Sheriff’s Detective—obsolete from the payroll. Mr. Odham was a friend of Leon County Sheriff Larry Campbell and Sheriff’s Campbell’s son, Assistant State Attorney Jack Campbell. 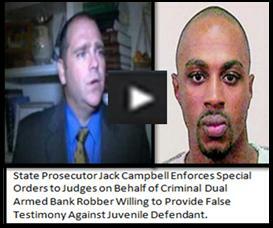 It was Assistant State Attorney/Prosecutor Jack Campbell and Mr. Odham who would forge ahead with falsifying court documents. And recruit a slew of other judicial officials, including State Attorney Willie Meggs and Leon County Sheriff’s officials, including members of Sheriff Larry Campbell Command Staff—to ensure the conviction of DeShon. DeShon is INNOCENT! Psalm 3:7 Arise, O Lord; Save me, O my God! For You have struck all my enemies on the cheekbone; You have broken the teeth of the ungodly.